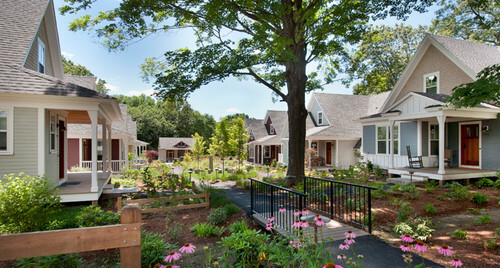 On another "Why it's Great", we're looking at this community design of 13 homes by Union Studio in Boston. This design illustrates what is great about thoughtful planning and design. Bringing people to their front yards facilities a connection with others. As opposed to driving a car into a garage and not coming out until the person leaves again via car. Each home has a designated garage bay and parking space in a parking court. They were each provided with a cart for groceries and such. Solar collection and other systems make it possible for these homes to have all their energy needs met. Instead of houses facing each other with concrete sidewalks and driveways, this space utilizes permeable ground which keeps air cooler and helps with surface water management. We certainly need more communities like this. I was perusing Houzz earlier this week like any good design addict does while wasting a little time and came across this photo from Emerick Architects in Portland Oregon. It immediately made me stop and stare for so many reasons. I'd like to point them out to you in my very first installment of "Why It's Great". I'm certain the lights are on in this picture for photography purposes. I guarantee the homeowners don't turn on the lights in this room from sun up to sun down. Added bonus, those windows are beautiful. Using repetition and pattern these windows make artwork unnecessary. It has loads of beauty because they didn't over-design it. It's a spacious kitchen, but it isn't overloaded with a crazy amount of cabinets. The stainless steel countertops look sleek and clean, yet accessible and durable. Ductwork in a conditioned space. I did a post about this a few months ago. By using ductwork in this way, you can save 15-20% on your electricity bills and also get a smaller HVAC system upon installation.